Before we begin to discuss the impact of rates rising, let's discuss where a move like this stands in historical context. In reality, it has no historical context. The following chart (courtesy of the incredible real estate analyst Mark Hanson) shows historical mortgage rate rises over a short period of time. The closest comparison would be back in 1993 when rates moved 35% higher over a 14 month period. What just occurred in June? Rates moved 45% higher over a 6 week span. Absolutely without precedent in the real estate market. It may appear to the casual observer that although the move was enormous in terms of total percentage, it is still just a 1.5% move and rates "are still historically low." This is the incorrect way to view future home price directions because the price of homes in May 2013 had "priced in" 3.5% interest rates. 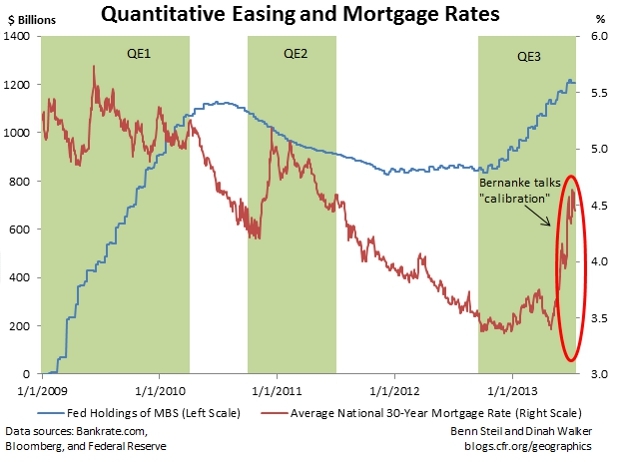 What happens with rates after that point will create a relative change in the market from that point. We'll help explain this concept using multiple examples. 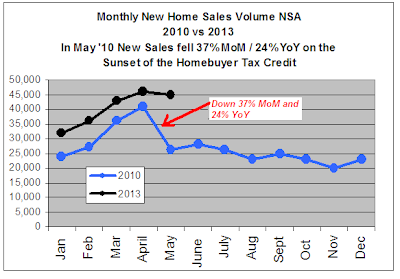 Before moving on to existing home details, we'll briefly walk through how this impacts new home sales. It takes somewhere between 5 to 8 months for a home to be built from the point a buyer goes under contract to the completion and closing of the home. 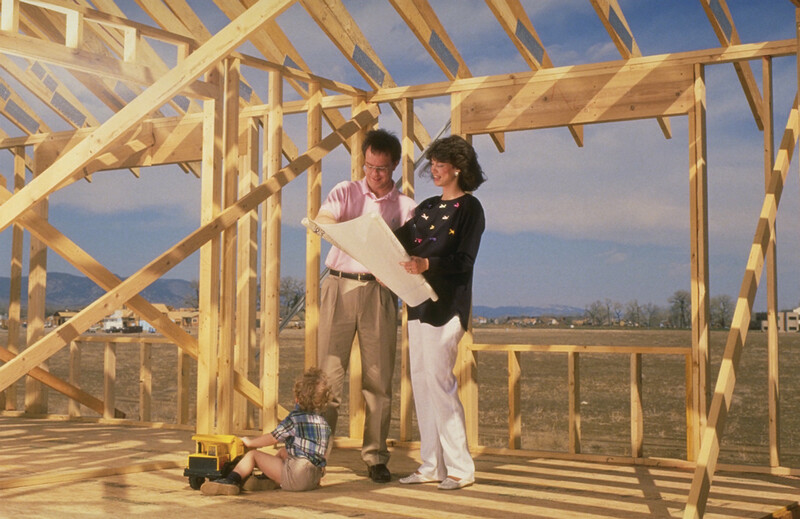 Building permits can take 4 to 6 weeks to pull and the construction of the home usually takes 3 to 5 months to complete. Before a buyer goes under contract they usually have a conversation with their mortgage broker to figure out how much home they can afford. This helps them determine which home style to purchase and what to put into it. During the first five months of this year, buyers were making this determination using interest rates that were under 3.5%. The problem is that they do not lock in their interest rates when they go under contract, that usually comes around 30 days before the home closes. 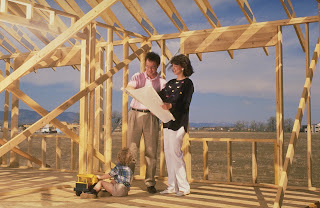 A nice couple is beginning to watch their American dream come up out of the ground in June when they turn on the news to see that interest rates have super spiked. After calling their mortgage broker they find some troubling news. Their home affordability, or what they can afford to pay every month, has fallen by 20% almost over night. Even if they could still technically qualify for the home, would they still want to? This is just one small aspect of the market. 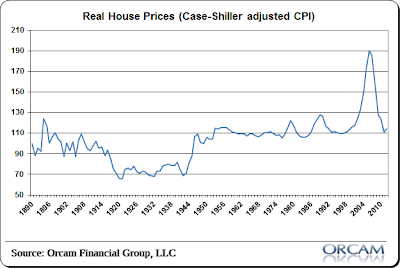 Let's now look at a line that you have probably heard a thousand times during the artificial real estate recovery: "Homes are more affordable today than almost any other time in history." This is incorrect, and the following chart helps explain why. Homes are purchased with a mortgage. 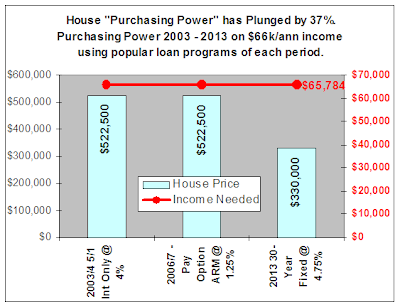 What you can "afford" means what your monthly payment will be based on your income and the mortgage product available. Due to the exotic loans available at the time, you could purchase a $522,500 home in 2003 and the same price home in 2006 with $65,784 in income. What does that income buy you today? How much can you afford? Only $330,000. Now, you may say, "well that's because you were using crazy loan products." That is exactly the point. 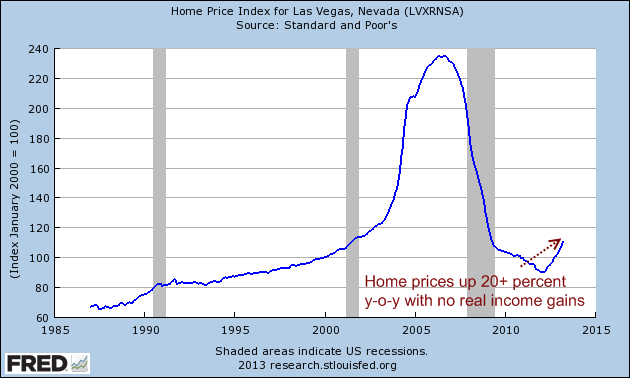 People that say home prices are cheap today because "they are way off the peak in prices." 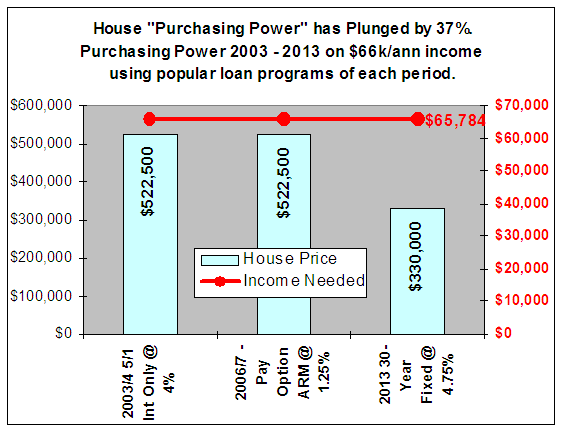 The only reason they reached that ridiculous peak in prices is because of the insane loan products. Just as the only reason they had a short term bump in prices in 2010 was because of the insane tax credit stimulus. 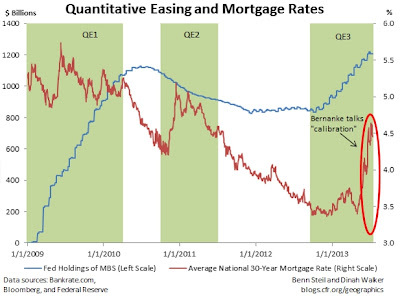 Just as the only reason they are currently having a short term boost in prices is because of the insane artificial Fed induced mortgage rate stimulus. Do you see what happens every time one of these artificial stimulus tools is taken away? The recent artificial mortgage rate under 3.5% was a FAR bigger (temporary) stimulus on the market than the 2010 tax credit was. Buyers in the higher price points could afford $100,000 to $200,000 more home with rates moving from 5.25% to 3.25%. This temporary move in rates was 100% Fed induced. The worst time to purchase a home is when prices have recently risen and interest rates are very low. However, you may feel that the third category, a growth in income, will be large enough to offset the other two moving in the wrong direction. Here is a brief snapshot of income growth since our depression began in December of 2007. You have to believe that this income decline has bottomed and is about to skyrocket. The jobs data has shown that during this current depression high paying jobs have been replaced with low paying part time jobs. The Obamacare economic weapon of mass destruction will only put this trend into overdrive. U.S. GDP growth continues to decline and forecasts continue to be lowered on what we will see in the quarters ahead. 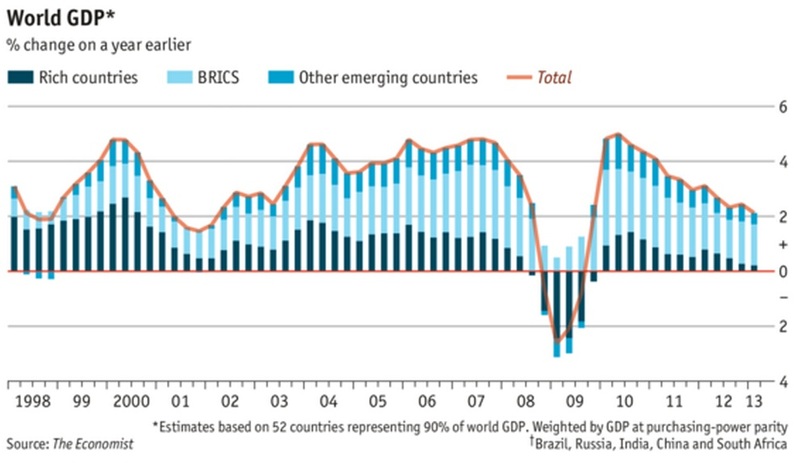 The global economy is also growing at a much slower rate. 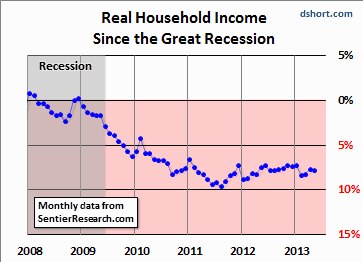 The economic data is pointing toward incomes collapsing in the months and years ahead. A large portion of the recent GDP growth has been due to the temporary real estate recovery which can be seen in the chart below. 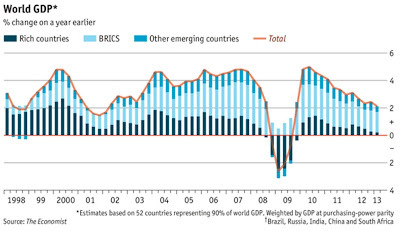 If this recovery should falter, it will hit the overall GDP significantly, creating a spiraling effect on incomes. Another factor we've been told will continue to push home prices higher is the new institutional buyers that are paying all cash for homes. 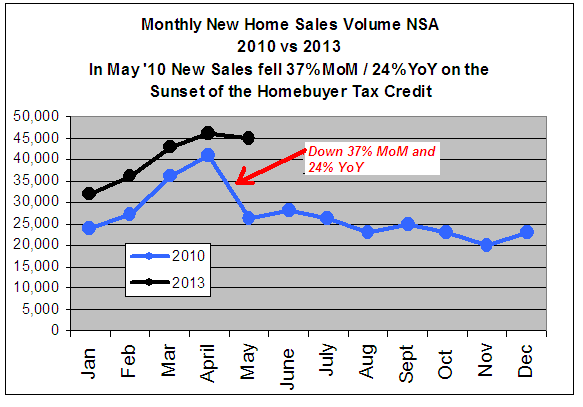 These buyers were already showing signs of exhaustion heading into June, before the mortgage rate massacre. Their models are based on offering 10% to 20% above the listing price and paying all cash for a home in order to ensure rapid accumulation of properties. 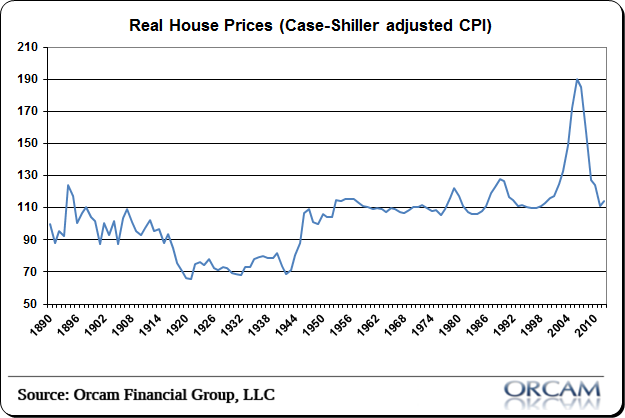 I hope I do not need to explain why this does not represent a long term foundation for real estate price appreciation. In addition to the new home buyer's financial model just discussed above, these institutions based their financial models against the 10 year US treasury under 2%, where it has been most of the last year. In June, the 10 year super spiked to 2.75% before its recent fall to around 2.5%. This completely throws off many of the cash flow models as all risk assets need to be adjusted against this risk free rate. A recent addition to the party has been the flippers which as you have been reading in the headlines are now back in full force in the markets. Flippers bring with them an additional gift to the markets as they are rising in price. If a flipper purchases a home for $100,000, puts $50,000 of work into it and sells it for $225,000, it is shown as a $125,000 gain in the home price over a 6 to 12 month period. In reality, the rise in home price was only $75,000 because $50,000 of the total price rise was due to materials being added to the home. This becomes even more extreme as you begin to move into the higher price points. 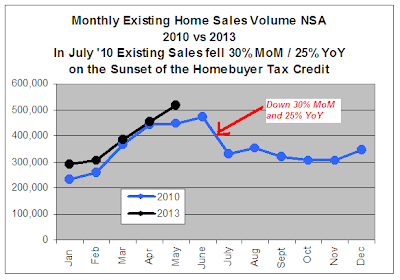 This is why you are seeing some cities in Florida recording 82% year over year gains in price. The flippers are super charging these numbers with their sweat and materials put into the homes. Just as before, these get rich quick late entrants to the market will be annihilated during the next down draft. Remember that while some markets, such as Las Vegas, are 20% off the lows, a longer term chart helps put the markets in perspective. 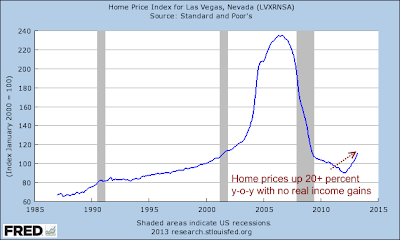 For more on Vegas see Behind The Curtain Of The Artificial Real Estate Market. Where will home prices be 6 months from now? I have no idea. The Federal Reserve could announce that they are tripling the size of their mortgage purchase program instead of "tapering" it. This would send home prices much, much higher in the short term as more investors and buyers piled on to the trade. Prices will eventually find their true natural bottom when the Fed finally loses control of the bond market. I assure you that no investor around the world will hold a mortgage backed security at 3% if a 30 year risk free treasury bond is at 6%. The more the Fed intervenes into the market, the more catastrophic the coming correction in prices will be. I have been reading and learning as much as possible from various new sources. Thank you for summing everything up in a comprehensive article. This substantiated every aspect regarding what is expected of the market in the near future. We should not stick into one plan because it might fail as well in our Investments in Real Estate. We have to develop more strategy that we can use to prevent failure in our business. What is important is that we must show responsibility in everything that we do and always keep our heads high to know where we can get the information that we needed towards our success. 100% commission real estate Palm Beach are online offices that offers agents to join their profile and crack deals without splitting their commission. She's amazingly organized and is always on time which in Miami is hard to come by as the agents are notoriously late.Tinley Park houses for sale I made a trip from California and literally had 2.5 days to find a home to live in and was under a lot of stress trying to find the right place.